Phillip started at 15, playing local League Billiards. He has represented England 21 times, winning 7 ABC National Ranking events, 1 English National Billiards Championship (All England) and 2 English Amateur Championships. 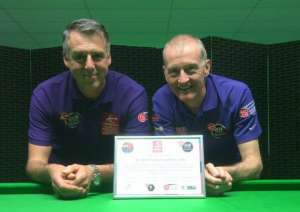 He is a qualified WPBSA, World Billiards and EASB coach and his highest break is 408 in practice, 289 in competition. Phillip was one of the founder members of EBOS in 2004 and is still involved with World Billiards as Head Coach of the recently announced World Billiards Coaching Scheme. He lives in Kings Lynn and has been married to Caroline for 27 years. They have a son Bruce. He has worked for the Royal Mail for 30 years.